I joined a gym here in December, in an attempt to maintain physical and mental health. It was not a decision I made lightly, since it is quite expensive. It's kind of a rip-off. It costs about what a nice gym on the Upper West Side of Manhattan costs (between $75-$80/month, depending on the exchange rate, which is only a little bit less than I paid for the New York Sports Club, circa 2004-2007, when I belonged), and has worse machines, facilities, and service. There are elliptical machines, but only the kind with pedal-like foot things and arm things, not the kind on which you can change the angle or even the resistance, as far as I can tell. One of the treadmills produces electrical shocks every time you touch it, or continuously if you have earbuds in your ears while you run on it. The stationary bikes, a relatively new addition, do not have individual televisions. The only non-bike, non-elliptical machine, non-treadmill is usually either broken or its television is broken. I joined this gym, instead of a slightly cheaper one, because it seems to have decent ventilation, nice showers, and an individual TV by most of the cardio machines. It also has enough elliptical machines that I can get one almost every every time I go (weeknight evenings) without waiting. Anyway, so now I watch Israeli TV about three times a week. 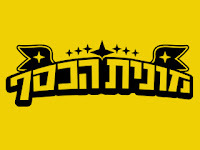 One of my regular shows (besides Friends, ER, and Ugly Betty) is "מונית הכסף" ["Money Taxi"]. Apparently (I didn't have a TV in the US and therefore didn't know), this is like an American show. Unsuspecting Israelis hail a taxi, get into it, and are shocked to find out that they're on a quiz show on national television. It has flashing lights inside and you have to reach your destination without getting three wrong answers in order to win your grand prize of the money you've accumulated by answering questions correctly. If you need help, you can call someone on your cell phone or lean out the window and ask someone on the street. The questions are a mixture of Israeli politics, popular music, literature, and some basic world history. There is also a smattering of basic Jewish questions ("What are the names of the four sons at the seder?" "For what sin were Adam and Eve kicked out of the Garden of Eden?"). To my pleasure, most contestants seem to get the Jewish questions right, as well as the Israeli politics and general sports questions, which I couldn't answer in a million years ("What is the nickname of MK Yossi Cohen?" "Which soccer player is known as 'the bomb'?"). One question that neither I nor the contestants could answer last night was "Which Israeli highway goes from Metulla to Eilat"? I guessed 1, the contestants guessed 4, the answer was 90. Sometimes, there are questions that I wouldn't expect them to be able to answer: "What was Elvis Presley's middle name?" The answer is Aaron, which sounded familiar to me once it was revealed, and which was mentioned in the subtitles (there are always subtitles on at the gym) as "Aharon," i.e. אהרון. However, last night, there was a question that elicited a humorous response, in my eyes. The question, "What was the author Kafka's first name?" The contestants weren't sure, and threw around Yossi or Moshe as possibilities. "Wait," one of them asked, "was he even Israeli?" None of them knew. They called one of their sisters, who said, "Maybe Chaim?" so that's what they went with. When the correct answer was revealed as "Franz," they cursed the Ashkenazim who they said rig these games to be biased towards Ashkenazim! In general, I find the show interesting, both for the questions that contestants can and can't answer, and for the banter between the driver/questioner and the contestants, and between the contestants. There are some dati/chiloni [religious/secular] jokes, and some Ashkenazi/Mizrachi jokes. I don't think I've heard a single question referring to Arab culture or history, unless you count a question about the birth country of a famous Egyptian singer (who I had never heard of). There aren't usually questions about current events. Anyway, just another slice of Israeli life. Now that the days are longer and the weather is better, I may be giving up my posh gym membership, since I really can't afford it. Peretz was born in Morocco. You don't get more Mizrachi than that. Money Taxi sounds hilariously awesome! The gym...less so. Yes, but there was no way Amir Peretz would have been asked to form a government in 2006. Those 19 seats represented a big drop in the number of seats Labor had before (though a lot more than they have now), which was considered a reflection of the voters' disdain for Peretz. A better example would be David Levy, who was considered a serious contender for head of Likud in the 1980s, at a time when the prime minister would most likely have been chosen from Likud. As for Elvis Presley's middle name, why not say it was Aharon? After all, the man was halachically Jewish--his great-great-grandmother on the maternal line was a Jew. In the US, the show is called "Cash Cab", but the idea is the same. Thanks, Sarah! "Cash Cab" is a much better name than "Money Taxi"!